In this wandering kind of walk, we’ll a version of a dérive, described by Situationist theorist Guy Debord as “a mode of experimental behavior linked to the conditions of urban society: a technique of rapid passage through varied ambiances.” Simply put, we’ll drift somewhere from Monument Circle and then return in an equally unplanned way, talking about some of the reasons for this kind of approach. Situationism is the idea that behavior is chiefly a response to immediate situations — what’s happening now. 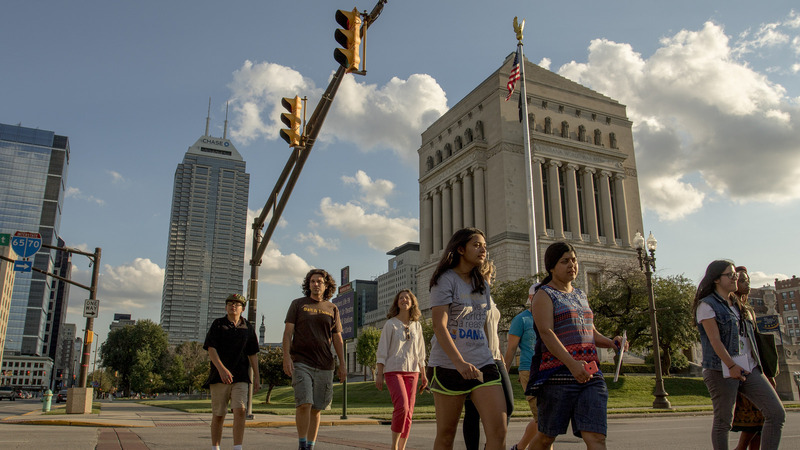 Step into a new mindset and wander Downtown Indianapolis as a Situationist with Jim Walker and Tedd Grain sort of leading. Dérives are necessary, according to situationist theory, because of the increasingly predictable and monotonous experience of everyday life in advanced capitalism. The dérive grants a rare instance of pure chance, an opportunity for an utterly new and authentic experience of the different atmospheres and feelings generated by the urban landscape.